After touching down in the highest capital in the world, BAI's Bolivia expedition team heads to the Cordillera Real with their sights set on some of the major peaks in the Condoriri Group, including the snow-covered pyramid of Pequeño Alpamayo (5370 m/17,618 ft) and perhaps a day hike up Cerro Austria (5000 m/16,405 ft) from a beautiful base camp on a pristine lake, before focusing on the famous and highest mountain in Bolivia, Sajama at (6542 m/21,464 ft). Please stay tuned and follow us on our adventure! June 26, 2008 – Piece of Cake! 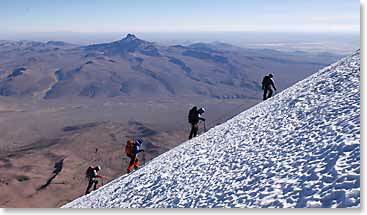 June 22, 2008 – On Pequeño Alpamayo Summit! June 20, 2008 – Summit on Cerro Austria! June 16, 2008 – The Bolivia 2008 Team Arrives!